“2018 is a dream year for me,” the 33-year-old Modric said. 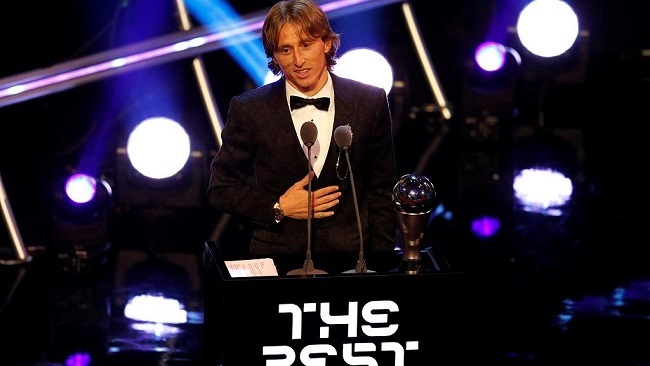 “Throughout my career I realized hard work, persistence and belief in yourself in difficult moments are the foundations of success.” Modric’s father was shown on the big screen wiping away tears during the ceremony at the imperious Grand Palais in Paris. France coach Didier Deschamps said a France player should have won the award. “They deserve it because of what they did with the national team at the World Cup and also because of the trophies they won with their clubs,” Deschamps said. The 19-year-old Mbappe the youngest player since Pelé to score in a World Cup final won the Raymond Kopa Trophy awarded to the best young player. France Football magazine has been awarding the Ballon d’Or since 1956, and created a women’s award for the first time this year. The outspoken 23-year-old Hegerberg said she won’t play for Norway at the Women’s World Cup in France next June. Taking a stand against what she describes as a lack of respect for female players in Norway, she hasn’t played for the national team since 2017 when it crashed out of the group stage of the Women’s European Championship without scoring a goal.